After spending some time with bright citrus colors, I wanted to explore another side of orange–the creamier, peachier side of a zesty shade. I realized, though, that as soon as I dialed back the intensity of orange to a softer, peachier tone, it became more of a backdrop or frame for other elements of the look. So, although a Creamsicle-soft orange lip and cheek was the starting point of this look–the touchstone that determined my other choices–in the end, it’s really the eye makeup that’s the center of attention in the final look. Because I wanted to use a creamy, soft orange shade for cheeks and lips, I thought it would be nice to choose contrasting shades and textures for eyes, to add interest. Rather than choosing a very cool blue eyeshadow, I headed for purple instead–purple is just a tad warmer than blue, I believe, which helps to keep the contrast from being too stark. Not that there’s anything wrong with stark contrasts! I was just in the mood for purple. It feels like a nice color for early spring. I have more purple shadows in my collection than I have blues, so I had quite a few choices–from pale, shimmery lavenders to lilacs with a touch of pink and white to mid-tone purples with a hint of red to deep blue-purples. I chose the NARS duo in Kauai because the purple shade seemed to strike just the balance I was looking for–not too bright, not too dark, not too red. (It does veer toward blue a bit, especially in direct light, because of a slight duochrome effect.) 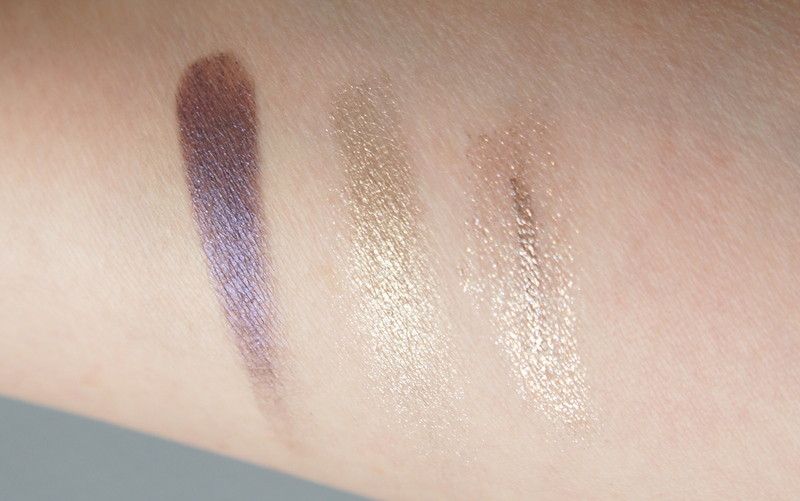 Not incidentally, the other shadow in the duo is one of my favorite soft gold/platinum shades of all time–not too yellow, not too silvery…just right. I also thought that a metallic finish would be a very nice pairing with the creamy-soft, sheer oranges I chose for cheeks and lips–Revlon Lip Butter in Juicy Papaya and the By Terry hyaluronic-acid enriched liquid blush, Peach Posh. Both of these are crazy-wearable peachy-oranges. 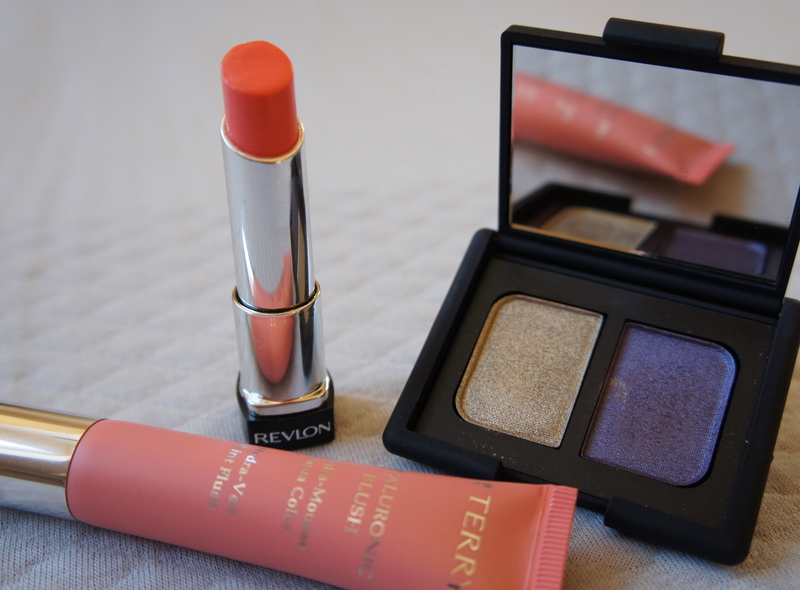 By Terry hyaluronic acid blush in Peach Posh; NARS eyeshadow duo in Kauai; Revlon Lip Butter in Juicy Papaya. I’m one of Lisa Eldridge’s many devoted fans. One of the tips she gives in her Plum Chic video is to use a bit of bright, sparkly or metallic liner along the lash line when using a strong, dark shade all around the eye. According to Lisa, this helps to bring light and dimension to the eye, and it’s hard to argue with the results when she pats a gleaming, coppery pigment around her lash line in contrast with a deep, plummy shadow. When I tried this look out on my face, I realized that this might be a good moment to try this technique, because things were looking a bit flat and one-dimensional around the eye with just the purple shadow smudged about, and I didn’t want to add a black pencil to introduce some dimension. Somehow, black seemed to heavy for a springy look. I took my cue from the pale gold/platinum shadow in the duo and dredged a platinum liquid liner from the back of my stash to add some brightness along the lash line. I was pretty excited to use it, let me tell you. It’s been sitting quietly, waiting for its moment, for quite a while. Chanel liquid liner in Platine; NARS eyeshadow duo in Kauai. 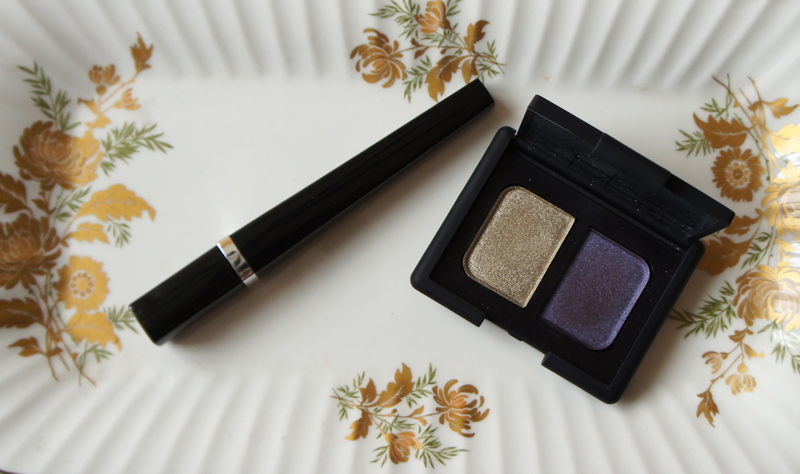 From the left: Purple and gold shades from NARS eyeshadow duo in Kauai; Chanel liquid liner in Platine. I’m the worst swatcher ever. I started to blend the liquid liner a bit, and then I realized that I’d blended it way to much, so I drew another line of it through the middle of the blended bit…well, I’m learning, slowly. From the left: Revlon lip butter in Juicy Papaya; By Terry hyaluronic acid blush in Peach Posh; gold shade and purple shade from NARS eyeshadow duo in Kauai. And that’s the product set for this simple-but-dressy spring makeup look. Platinum liner might be a bit much for work, but I imagine this look would be nice for a spring-day occasion. Those do seem to have a way of popping up–all those weddings and graduations and things. I’m always wracking my brain for looks that will seem right for those events–dressy, but still day-appropriate–so maybe this will be one of those. I’m looking forward to showing you how this turned out on my mug very soon! In the meantime, I hope you have a lovely day. Oh, I’m glad I chose Kauai to show you, then! 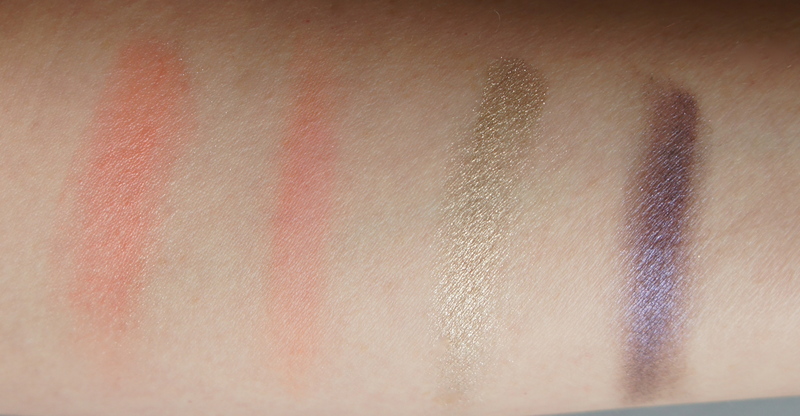 I love eyeshadow duos–they’re so easy to use–and this one is especially nice for spring. Kauai is a beautiful duo! I love the pairing with a juicy orange. 🙂 love your thoughtful color compositions, bunikins!